Just a reminder.... Tomorrow, Thursday, November 5th, is the first day of the Barnes & Noble Bookfair, benefiting the Costa Mesa Library Foundation in it's efforts to build a new Costa Mesa Main Library. I wrote about it in a post last week, which included a copy of the flier and samples of the vouchers - neither of which are necessary to participate in this wonderful fund raising effort. The Bookfair takes place from the 5th through the 8th, with special events at the Barnes & Noble store at Metro Pointe. You can make purchases at ANY Barnes & Noble store, though, and get credit applied to the fund raising effort by simply giving the clerk the ID number, 10008878, at the time of purchase. I've attached a copy of a recent email sent by the Library Foundation that explains the program in detail. Please take advantage of this opportunity to help a very worthy cause and buy some of your Christmas presents this weekend. The CMLF is having our 1st Annual Barnes & Noble Book Fair fundraiser this Thursday through Sunday at the Metro Pointe B&N location. Please join us for one or all of our events and make sure to do some shopping! 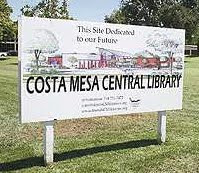 Visit the Costa Mesa B&N (or any other B&N location) between November 5 and November 8 and almost anything you buy will support our efforts to build a new central library in Costa Mesa. All you need to do is show them a flyer, voucher, or give them our ID # (10008878) to make sure we get credit. As a bonus, if you show your receipt to the CMLF staff after your purchase, you will be entered to win a basket with $200 worth of books, audiobooks, and gift cards! You can buy magazines, books, calendars, food, sandwiches, coffee, DVDs, music, and just about any other tangible item for yourself or as a holiday gift. If you usually use the library to check out books, support the CMLF by grabbing your morning coffee and a pastry and or stop by later for a sandwich and some holiday shopping. As long you supply a flyer/voucher or our ID #, we will get credit for your purchases. Members of the CMLF will be staffing a table at the top of the escalator and will be handing out free wristbands, bookmarks, and pamphlets about our foundation and discussing the need for a new library. Peter Rabbit story time with characters in costume! Award-winning audiobook narrator, Rosalyn Landor, will talk about her recent recordings and shed some light on the audiobook profession. A half-dozen of her titles will be on hand should you want to have your copy signed. If you’ve already done your holiday shopping or will be out of town, please forward this message to any friends or family who can attend. We are really hoping for a great turnout!